This was easily Jack's favourite part of the project this half term! The frames are made out of pipe cleaners, twisted together (carefully to avoid any sharp bits), one for each eye and one for each arm. These fit Jack, so you might have to adjust that if you want to make some for different sized people. The lenses are cellophane. We drew round the frames to get a template and then attempted to glue them to the pipe cleaner frame. We failed.... and wound up using double sided sticky tape instead! 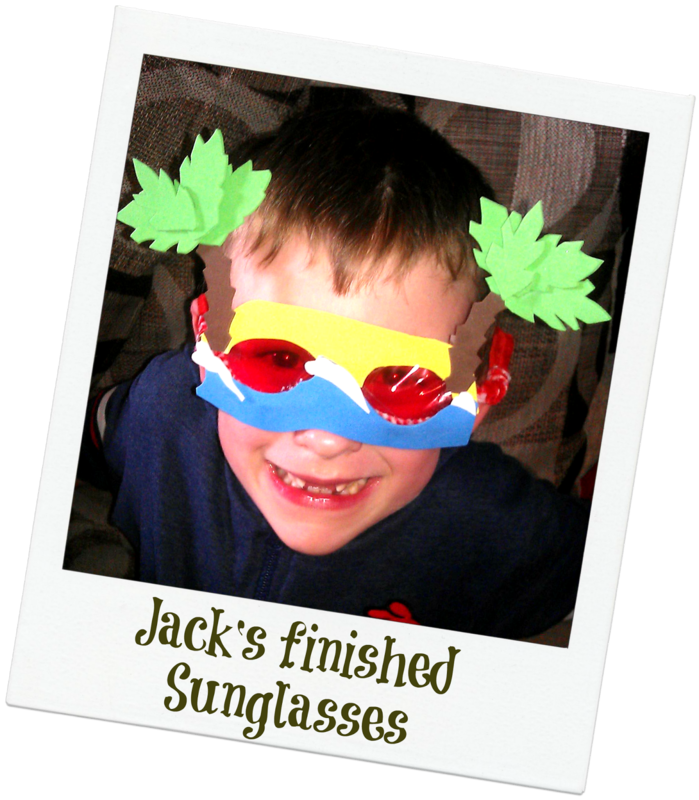 Jack wanted novelty sunglasses an had been on Pinterest looking at some super hero masks and other similar things made with fun foam. He wanted a proper beach theme, so we went with sand, sea and palm trees. I admit I talked him out of buckets & spades, people, deck chairs, assorted fish and sea shells etc. simply because they are supposed to be sunglasses and not a full mask! (Although we me might just do it for fun for ourselves later!) I helped him with the cutting and sticking - no way was I about to let my 6 yo lose on Super Glue! He loved putting it all together and wouldn't take the off all evening once they were made (and the glue had set).